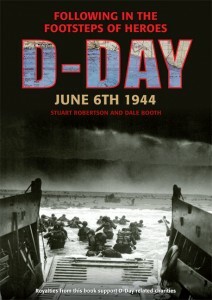 To be used as a history book or as a guidebook for visitors to the battlefield, the authors use a compelling combination of background narrative and first-hand accounts in this lavishly illustrated guide that will touch every reader, providing a new perspective into the world’s greatest ever seaborne invasion – June 6th 1944 – D-Day. Stuart Robertson is a history graduate of the University of Leeds (UK) and full time battlefield guide. After working as an archivist with the UK Ministry of Defence he has been a permanent resident of Normandy since 2004. Stuart has shared his extensive knowledge with thousands of visitors to the region including past and present military personnel, security services from across the globe, currently serving and retired politicians, many university groups and a multitude of individuals and organisations who have travelled from all over the world to tour with him. He is most proud of his association with the many Normandy Veterans he has met and become friends with. Dale Booth spent five years in the British Army as an Infantryman during which he experienced two active tours. Having a passionate interest in the Second World War and an in-depth knowledge of life as a soldier he moved to Normandy in 2003 and has worked as a battlefield guide ever since. With a broad and in-depth knowledge of the Normandy Battles both authors are now full time battlefield guides offering bespoke tours of the region.